I feel awful for leaving a McDonald's Bacon & Potato pie atop the blog here for so long. So to make it up to everyone, I have decided to track down the answer to the world's most urgent question: what would the automotive present look like if only Jean Bugatti's Type 57SC Atlantic had been more popular? Or Buckminster Fuller's Dymaxion Car? Or really, Georges Paulin's entire oeuvre for the coachbuilder Pourtout? Well, I think the French artist Alain Bublex has started with the last one first. 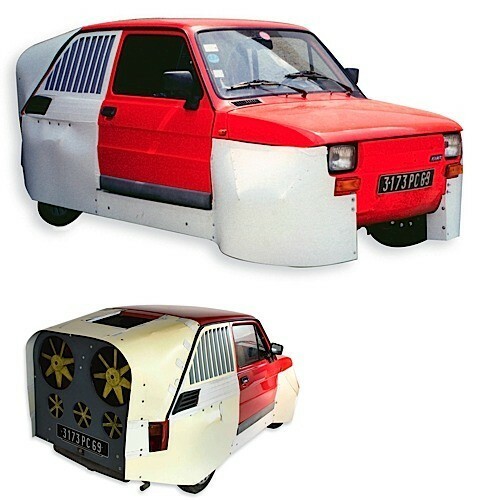 His Aérofiat series creates alternative design histories for the lowly Fiat 126 which all originate in the aerodynamic concept cars and custom carrosserie of the 1930s. Which basically means tricking out the little go-karts with ground effects that range from the insane to the impossible. The prototype for Aérofiat 5.1 (2002), pictured above, will be auctioned off December 7, along with a collection of original drawings and plans. The estimate of EUR20-25,000 strikes me as both entirely reasonable and fantastical.